Online Arts & Craft Bungalow Auction — Harritt Group, Inc.
10% Buyer’s Premium added to the hammer bid price to determine final purchase price. 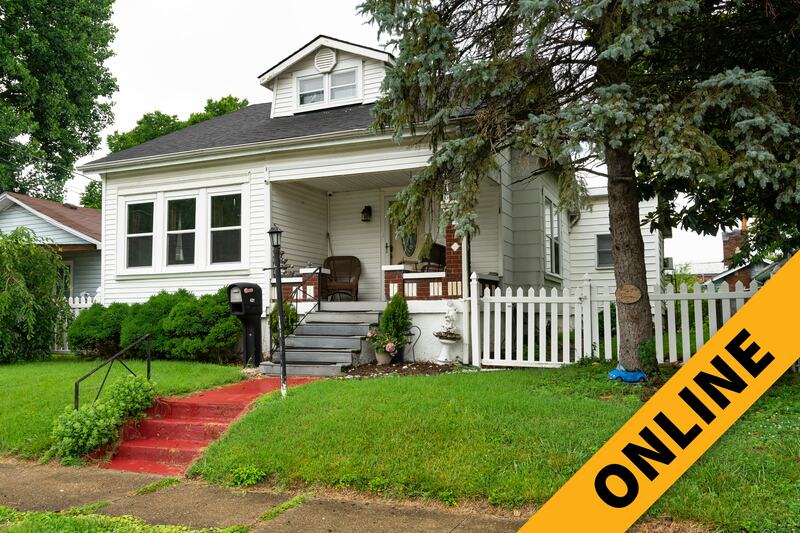 Charming 1920’s arts & craft style three bedroom bungalow in the heart of old Clarksville just minutes to Clarksville Aquatic Center, Colgate Park, Falls of the Ohio and downtown riverfront. Great opportunity to own your next home or rental investment! Quaint 1513 square foot 1 1/2 story cottage built in 1926 includes finished attic plus unfinished basement, covered front porch, wood deck, carport, shed and above-ground salt water pool with Intex sand filter pump on 50’ x 140’ lot. First floor features a spacious equipped eat-in kitchen with tile floors, living and family rooms, master bedroom with french doors, office, full bath plus equipped laundry room with 1/2 bath plus 2 additional bedrooms up. Improvements include partial window replacement, roof replaced 2009 & new hot water heater 2018. A great location easily accessible to Brown Station Way or I-65! Browns Station Way (Old Hwy. 62) to South on Randolph Avenue to right on Harrison Avenue to left on S. Clark Blvd. Continue 2/10 mile to right on W. Howard Avenue. 2/10 mile to home on right.